10 years ago the Eton Wick History Group collected the life stories of the men and women who saw service during World War 2 and were living in the village in 2005. There are the recollections of 53 people in Recall 60 years on and many other stories. In the run up to the 70th anniversary of the end WW2 we will be publishing many of these other stories on this website. Here is the first article. Following the outbreak of World War II, a National Service Act decreed that all fit men aged between 18 and 41 years of age were liable for service. In 1941, a further Act extended the service liability to include women and those aged between 18 and 51 years. In effect, few over 41 years were called and none over 45. All those falling within the eligible ages were obliged to register, usually at their local employment exchange. In the last four months of 1939, 727,000 registered. In 1940, 4,100,000 registered and in 1941, 2,222,000 registered. From then on the majority of those eligible had registered for service and numbers fell off except for those reaching the age of 18 during the past year. Many were exempt from service on account of doing essential work in industry, commerce, agriculture, transport or other such occupations. Others of course, failed the fitness examination. The classification of reserved occupation was constantly reviewed and few felt completely secure in their civilian status. The founding treasurer of the EWHG, John Denham was in a reserved occupation as an apprentice with an engineering company in Taunton. During this time he was a member of the local Home Guard. When he finished his apprenticeship in 1944 he was conscripted at the age of 19 and saw service in Burma and Singapore. 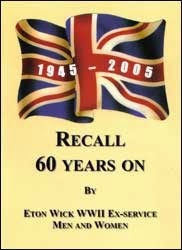 Please note Recall 60 is now out of print.